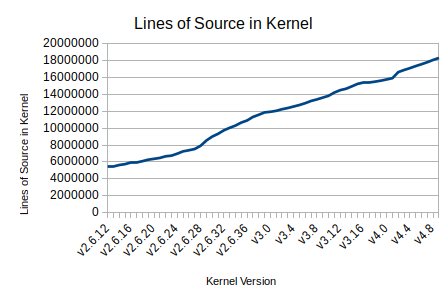 The kernel contains tens of thousands of statements that may print various errors, warnings and debug/information messages to the kernel log. Unsurprisingly, as the kernel grows in size, so does the quantity of these messages. I've been scraping the kernel source for various kernel printk style statements and macros and scanning these for various typos and spelling mistakes and to make this easier I hacked up kernelscan (a quick and dirty parser) that helps me find literal strings from the kernel for spell checking. 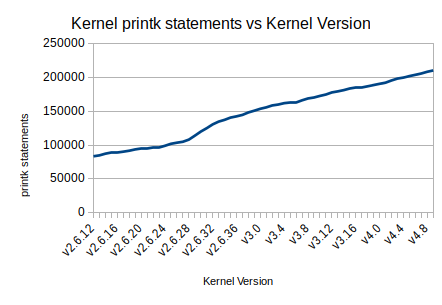 So how many lines of code in the kernel do we have per kernel printk messages over time? ..showing that the trend is to have more lines of code per frequent printk statements over time. 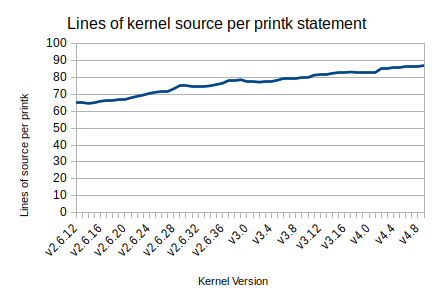 I didn't differentiate between different types of printk message, so it is hard to see any deeper trends on what kinds of messages are being logged more or less frequently over each release, for example, perhaps there are less debug messages landing in the kernel nowadays. I find it quite amazing that the kernel contains quite so many printk messages; it would be useful to see just how many of these are actually in a production kernel. I suspect quite large number are for driver debugging and may be conditionally omitted at build time. Another year passes and once more I have another seasonal obfuscated C program. I was caught short on free time this year to heavily obfuscate the code which is a shame. However, this year I worked a bit harder at animating the output, so hopefully that will make up for lack of obfuscation. The source is available on github to eyeball. I've had criticism on previous years that it is hard to figure out the structure of my obfuscated code, so this year I made sure that the if statements were easier to see and hence understand the flow of the code. This year I've snapped up all my seasonal obfuscated C programs and put them into the snap store as the christmas-obfuscated-c snap. Below is a video of the program running; it is all ASCII art and one can re-size the window while it is running. Unlike previous years, I have the pre-obfuscated version of the code available in the git repository at commit c98376187908b2cf8c4d007445b023db67c68691 so hopefully you can see the original hacky C source. Have a great Christmas and a most excellent New Year.